Update 18th February 2013: Added information about Visual Studio 2012, removed a redundant library reference from the old DirectX SDK and added the library reference needed for the Direct2D Effects Framework. If you have developed applications targeting the original Direct2D (which we’ll call Direct2D 1.0) which comes bundled with Windows 7 and is also available on Windows Vista SP2 with Platform Update, there may come a time when you want to use features from the newer Direct2D 1.1 bundled with Windows 8. In particular, you may want to use the new Direct2D Effects API, the new multi-threaded application features or some of the new methods available in the updated bitmap or geometry interfaces. Windows 7 users must be running Service Pack 1 and have installed Platform Update for Windows 7, which updates Direct2D, DirectWrite and Direct3D to the latest versions of DirectX 11.1, as well as WIC (Windows Imaging Component, which you may be using to load bitmaps into your Direct2D applications for example) and WARP (Windows Advanced Rasterization Platform, a software rasterizer). Be warned that Direct2D 1.1 cannot be used in Windows Vista. If you update your applications to use the latest version, the minimum OS requirement becomes Windows 7 Service Pack 1 with Platform Update for Windows 7. If using Visual Studio 2010, you’ll need to install the Windows 8 SDK to compile Direct2D 1.1 applications. This includes the Direct2D headers and libraries and installs without problems on Windows 7. If you are using Visual Studio 2012, the Windows 8 SDK is already installed for you and you don’t need to download it. This will set every project to use the Windows 8 SDK in preference to the Windows 7 SDK. Warning: if you are compiling from the command-line, note that the INCLUDE environment variable does not reflect these changes, and $(WindowsSdkDir) will still be set to the Windows 7 SDK path. This doesn’t matter if you use the IDE to do your compiles. The Windows 8 SDK comes pre-installed with Visual Studio 2012 with all the default include and library paths correctly set, so you don’t need to do anything. You don’t need to change your linker input – d2d1.lib still contains everything, although if you weren’t using it before you will need to add d3d11.lib due to the new integration with Direct3D (see below). If you want to use the Direct2D Effects Framework, you must add a reference to dxguid.lib to your linker input. At this point I recommend re-compiling your existing application and make sure that it works as you expect. The new headers are backwards-compatible with the old ones so if everything is installed and configured correctly your existing code should compile and run just fine. Be sure to go to your project properties and in Configuration Properties -> Linker -> General, change Show Progress to /VERBOSE:Lib and then watch the build output when you compile your application to make sure that it links to the library files in the Windows 8 SDK folder. Note that even though your application will run, the new Direct2D features are not available yet, as Direct2D must be initialized in a new way to access them. Keep reading. If you use Boost you’re going to have the same problem as above every time you include a Boost header. Wrap your Boost header includes in the three pragma directives above to compile without encountering these warnings. One of my original complaints about Direct2D was that it was rather convoluted and over-complicated. Well, good news, Microsoft have listened to my feedback; then completely ignored it and made Direct2D 1.1 even more complex than the original. Not only is the initialization procedure obscenely complicated for an ‘easy-to-use’ 2D interface, but for those of us (and I believe it is the vast majority of us) who are targeting for desktop apps and really don’t care about Metro apps or Windows Store apps, the new sample framework and examples provided with Direct2D 1.1 are going to leave you scratching your head wondering how on Earth to access what’s new in your existing applications without completely re-writing them. A paragraph you can safely ignore if it means nothing to you: The new Direct2D sample framework uses the so-called C++/CX syntax introduced in Visual C++/Studio 2012 which is supposed to make using the new WinRT libraries and Agile window platform easier to use. I got you there didn’t I? Don’t feel bad if you don’t know what any of that is, I didn’t either. WinRT is a new set of APIs which is supposed to mitigate the need to use Win32 directly (think MFC, only usable), and Agile is a set of APIs for handling windows in Windows 8, especially for Metro apps. In short, the Direct2D sample framework manages COM interfaces/pointers completely differently, and has no Windows message pump or window handles (HWND variables) at all. Back in the real world, most of us have working Direct2D codebases which already deal with the Windows message pump and already memory manage our COM handles properly, so we need to throw their framework out of the window and find out how to update our existing code to use the new Direct2D features with the minimum number of changes possible. In addition, the documentation as it stands now is a mess of mixed information some of which refers to the original Direct2D workflow and some of which refers to the new workflow, so some of the code examples don’t work anymore, and some of the new ones only work if you are using WinRT and Agile, which we’re not. Among the usual includes in the header files of the sample framework, you’ll find a mysterious reference to wrl.h which stands for Windows Runtime Library (WinRT). This provides only one item of interest for Direct2D developers, namely the new ComPtr class which is a smart pointer class that saves you having to call Release() on COM objects when you’re finished with them. ComPtr holds a pointer to a COM object whose reference count is automatically decremented and the object released when the ComPtr instance goes out of scope. Note it is not the same as CComPtr which is found in atlbase.h. Windows in the Direct2D 1.1 sample framework are dealt with by the Agile library and there is a reference to include agile.h in the framework header code. Agile is only supported on Windows 8, and not interesting for standard desktop apps anyway, so you can just omit this header and ignore it. The sample framework uses CreateSwapChainForCoreWindow() to create the swap chain, and also suggests using CreateSwapChainForComposition() for targeting XAML applications. Neither of these are supported in Windows 7, and you must instead target a window handle (HWND) by using the only swap chain creation function not mentioned in the quickstart guide, CreateSwapChainForHwnd(). More on this below. Don’t worry if all this swap chain business went over your head, I’ll explain in more detail below. Regarding your Windows message pump, this can essentially stay the same as it was before with the same processing, and the sample framework code can be ignored. Figure 1. Initialization flow under the original Direct2D (left) and Direct2D 1.1 (right). The steps shown in light orange create temporary variables which you can discard after initialization is complete. ID2D1DeviceContext replaces ID2D1RenderTarget. Since Direct3D surfaces cannot be used directly by Direct2D, we have to employ an interoperability layer called DXGI to provide the Direct3D back buffer to Direct2D in a way it can use, adding further complexity. Additionally, where we used to just use the Direct2D factory to get a window-targeting render target directly, we now have to create a Direct2D device from the factory, create a Direct2D device context from the Direct2D device, then assign a bitmap to it as the render target. Quite pointless. Classes derived from ID2D1RenderTarget such as ID2D1HwndRenderTarget are no longer used. Instead, we always use the new class ID2D1DeviceContext (which also derives from ID2D1RenderTarget). ID2D1DeviceContext provides all of the rendering functionality we had before, along with new methods such as DrawImage and CreateEffect. 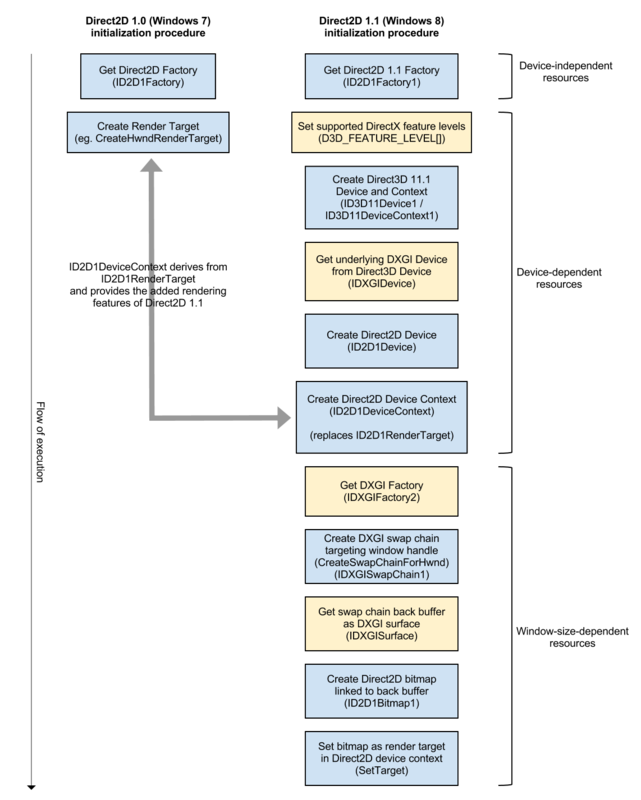 See the ID2D1DeviceContext reference for more details. If you simply change the type of your render target object in your application from ID2D1HwndRenderTarget to ID2D1DeviceContext instead, the new functionality will be available once the initialization steps are completed with no further modifications to your code. The cast is needed with the new factory function to avoid a compiler warning. // Retrieve size of client area and create a Direct2D render target of the same size that renders to the window's HWND. Throw that code away and hold onto your hats, here we go! Edit this list to contain the versions of Direct3D your application supports. This specifies to use the default graphics card (1st argument), hardware acceleration (2nd), no software rasterizer (3rd), supported feature levels (4th and 5th), current SDK version (6th) and returns the device, available feature level of the adapter and context in arguments 7-9. At this point you can make a choice. If you care about what happens when your application window is re-sized, you will need to re-run this code on every WM_SIZE event from your Windows message pump. By ‘care’, I mean, if you want the render target surface to be re-sized to match your application window size. In your current Direct2D applications, when the window is re-sized you may be re-sizing the render target with ID2D1HwndRenderTarget::Resize(). This no longer works in Direct2D 1.1 and should be removed. Using the code below, when the window is re-sized the render target surface will automatically be stretched when rendered onto the window to exactly fill the window’s new size (but the size of the render target surface itself will not be changed – only its visual representation). If you instead want to have the render target re-sized when the window is re-sized as in the old behaviour, you will need to run the code below each time the window is re-sized. Otherwise you can simply paste this code right after the end of the device-dependent resources code above and ignore WM_SIZE events. Earlier I mentioned swap chains. A swap chain basically describes a list of render target-sized buffers used for off-screen rendering and in what order to display them on the screen. Direct3D programmers will be familiar with swap chains already, but for those of you only using Direct2D this may come as news. In the original Direct2D, creating the swap chain was done for you but we now have to do it ourselves. See earlier in the article for notes about creating a swap chain that works with Windows 7 desktop apps. Width and Height are set to zero which means they will be automatically determined from the application window’s client size. The pixel format must be as shown for compatibility with Direct2D. SampleDesc defines multi-sampling parameters (an anti-aliasing technique); setting the values to 1 and 0 effectively disables it. BufferUsage specifies that this swap chain will be a render target and BufferCount specifies two buffers – one on the screen and one off-screen for the next frame. The Scaling and SwapEffect flags were discussed earlier. where m_hwnd is your application main window’s HWND handle. The 4th argument allows you to optionally specify a full-screen swap chain, and the 5th allows you to restrict which monitors the render target surface is displayed on (presumably for DRM purposes). You can generally just ignore the last of these, although some of you will need to make full-screen swap chains. Note the bitmap properties and pixel format and DPI settings must be exactly as shown otherwise creation will fail. We now use the Direct2D device context to render as if we were using an old-style Direct2D render target. When the device context draws to the Direct2D bitmap, it actually draws to the DXGI surface, which is itself the back buffer of the Direct3D swap chain which targets our application window. Therefore, everything seamlessly functions the same as before. You should not usually need to change the arguments to Present1 but you can find all the possible settings in the IDXGISwapChain1::Present1 reference on MSDN. At this point, your work is done. All your existing applications should now compile and work as they were before (besides the window re-sizing behaviour noted above), and if you want to use new features of Direct2D you just have to call the relevant new methods on your ID2D1DeviceContext object. Congratulations, you survived the nightmare! Note that there are new classes in Direct2D 1.1 which take the same names as the previous classes but with the number 1 added to the end of the class name. These are the updated versions of the classes with new methods and properties etc., and always derive from the original class so all the original functionality is available. You may wish to do a global find & replace in your project to replace the old class names for the new ones so the functionality becomes immediately available everywhere. In particular, consider looking at ID2D1Bitmap1, ID2D1BitmapBrush1, ID2D1PathGeometry1 and ID2D1StrokeStyle1. New classes which weren’t present in the original Direct2D don’t have any numerical suffix, eg. ID2D1Effect. …to wrap all this stuff in an endless amount of HRESULT checks with if (hr == S_OK), if (FAILED(...)) or however else you like. Always do this error checking as there are many possible points of failure and you don’t want to have random crashing behaviour on your end-users’ machines. I hope I’ve saved you some hair-tearing since what I’ve written in this article took me the better part of a day to figure out. There was no useful information on the net about most of these topics so I thought I had better blog it. Please leave feedback below! Unbelievable! Thank you very much, Katty! I am not used to leave a comments bellow an articles, but yours really “saves me in the nigthmare”. This is the only article I found about migration from “old Direct2D” to a new one. One proposition – you do need to create your own implementation of “Direct2D example” and put a link to code in order to share it with everyone. Some people will not to read a big article, they would like to have all “hot and quickly” in early prepared example. Anyway I am your “fan” now, Katty! You must request “ID3D11Device1” and “ID3D11DeviceContext1”. Also, I got it to work with VC++ 2008 on a Windows 7 64 bit Professional platform. The important part was to setup the VC++ 2008 project “Aditional Include Folders” to point to the Win8 SDK 8.0 folder, the um and shared folder. Direct2D fans might also find some of the articles by Kenny Kerr to be useful in learning Direct2D as well. Armed with Katy’s knowledge and that of Kenny’s, everyone should find getting to grips with Direct2D in ‘Dekstop Land’ that much easier. Kenny also has a ‘Windows with C++’ series of artlcles, currently running in MSDN Magazine, in which he also covers Direct2D in desktop applications. Here’s the March edition of MSDN Magazine with a Direct2D article. He continues with more articles on D2D1.1 in the May issue. Kenny Kerr also has a two-part training series up on Pluralsight called ‘Direct2D Fundamentals’ for those of you interested in a commercial training resource on the topic. Check in the Full Library -> C++ section on Pluralsight’s website. Im on windows 7 and I want to use direct2d 1.1 I downloaded visual studios express 2012 for desktop which I didn’t know if the one for windows 8 would work. and it is not working correctly im missing dh.x I think it was anyway a lot of the code for direct2d isn’t working. do I still have to add the executable directories and so fourth. which it looks like DX is a namespace but if I try to use it says named followed by :: must be a class or namespace name. Someone said it was a helper function for direct x but I don’t know. If I try putting using namespace dx or DX it says its not a namespace meaning it must be a class, but it doesn’t mention how to get it on the tutorials or show how its implemented. // Set a breakpoint on this line to catch Win32 API errors. But if I try to include DirectXHelper.h it doesn’t exist. Im guessing ThrowIfFailed does something similar to the HRESULT checks. Thank you for your answer disregard the last comment since I was typing it I didn’t see that you answered my question. I will follow your code on how to set this up I am just having a little trouble because I didn’t use the original direct2d and starting from this on I can only seem to find examples that are for people who knew how to use the original one. I went through the code on msdn to create a simple project with the old version of direct2d I will change everything as per your code. where does this code go I followed the msdn Creating a Simple Direct2D Application tutorial. The MSDN sample is (or was when I wrote the article) broken and/or only compatible with Windows 8. The window-size dependent resources goes in your handler of the WM_SIZE message (although you should preferably wait until the user has finished re-sizing the window before applying any changes since WM_SIZE is sent continually while the user drags the resize bars). Last question after this I might just toss Direct2D. I am having so many problems with this now I have everything working fine but I try to use FileOpenPicker and for some reason theres no such thing on there its undefined. I tried adding Windows::Storage::Pickers but its not there either. I don’t know why I even bother with it. Alright thank you, I just read if you want to take advantage of the effects in your article and I saw in msdn How to load an image into Direct2D effects using the FilePicker and thought it was needed. does this mean the I cant access the built in effects though. And forgive me for all the questions I have been having a hard time with things lately and it leaves me easily frustrated with things like coding. You don’t need to use FilePicker to use the Direct2D Effects Framework. I have written a bitmap collision detection demo (haven’t posted the article yet) using the effects framework which merely loads the images into Direct2D textures using WICImageFactory. going my theres no good documentation how to do it. Well that’s a few months away but if you download my Simple2D library and look at the source code for MakeImage() and the ImageObject class in Simple2D.cpp, the code for loading and rendering images via WICImageFactory in Direct2D can be found there 🙂 It doesn’t cover the effects framework though. Thank you I wish msdn would just update to cover 1.1 and not just throw a quick start for it and nothing else. They also seem to be lazy, earlier in this article you mentioned they made a mistake in the code an someone informed them of it. Well they never updated it. This is a really excellent piece of work – takes so much of the pain out of exercising new MS technology. Thank you so much for suffering the pain for all of us and saving so much time. I’ve now got you bookmarked! Terrific groundwork! Thanks for posting the fruit of your intellectual labor. Thank you very very much, could not get Direct2D 1.1 work under Windows 7, but now, after following your steps, it does! Thanks again! 1. Can I run my application on Windows XP and detect at runtime (by trying to create a factory) that DirectX 11.1 is available, or will the application report missing DLLs and fail to start? Same goes for Windows 7 w/o the Platform Update. 3. My application consists of Windows, I assume I can use a single ID2D1DeviceContext for all of these cost Windows messages are processed in a single thread. However, each window can perform animations in its own animation thread. These animation threads need access to all resources to draw the window. should there be a separate ID2D1DeviceContext created for each animation thread with shared bitmaps, or can I use the single ID2D1DeviceContext with locking? If I have 10 windows perfoming animations at the same time I can’t really use a single locked ID2D1DeviceContext for all of them, right? What about the deferred contexts and rendering to them to improve performance? 1. No, DirectX 11.0 is not supported on platforms below Windows Vista SP2 with Platform Update or Windows 7. DirectX 11.1 required Windows 7 with Platform Update or Windows 8. 2. I don’t know I’m afraid, I haven’t done any Windows 8 development with it. 3. I’m used to game coding so I don’t really know how it works with multiple windows, I assume you can lock the context and switch the render target view but it is probably woefully inefficient, it is probably less error-prone to spin up a device context for each window/thread. Thank you, thank you thank you!!! (cant say it enough times). If only the Microsoft folk could be as thoughtfully and thoroughly descriptive in their example code – adapting to “the new stuff” would become less painful than the proverbial root canal. The function “createswapchainforhwnd”, is only to be used for main application window.? and what about the other child windows inside it.? Also…is there any effective technique to manage resources in D2D. (ex. CreateBitmapFromWicBitmap and CreateSharedBitmap), which treats resources in different manner. Finally get it to work after puzzling through many of the issues you clarified in your excellent article. But now I find that the app simply ignores the alpha channel in whatever device context primitives I post to render target. Kind of ironic after all the boasting in the MS literature about the great, new, always alpha aware DirectX API. I have tried changing many setup options, all to no avail. Two partially transparent filled rectangles written over the top of one another simple show the most recently posted completing covering the other. Unless I set the alpha value in the fill color to 0, in which case, the rectangle is simply not displayed. Wondered if you have seen this behavior or have any ideas about where I might look for help with the problem. Thanks in advance for any help you can provide. I figured out how to avoid the crud you showed here! My thought: If I was implementing the backward-compatible ID2D1HwndRenderTarget, I’d just inherit/delegate from an underlying ID2D1DeviceContext. QueryInterface is your friend! I’ll pingback a WordPress blog post with the details once I write it up properly.